The Story: Saving Grace is definitely a 'must see' for those who occasionally smoke a reefer in their secret hide-out, trying to avoid being caught by parents, teachers, the police, etc... The protagonist is a lady in her forties, living in her mansion, breeding orchids, and absolutely unaware of the fact that her so-called rich and truthful husband is actually broke and cheating on her. 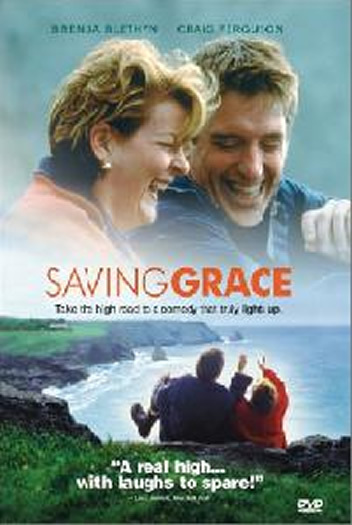 The story of Saving Grace is quite original, the performances outstanding! I can think of only a few movies that made me laugh more than this one. Still, the melodramatic touch is present. The film is typical British: the jokes aren't vulgar, there is no violence involved. It shouldn't be mentioned that it is recommended to have taken a few draughts before watching 'Saving grace'. It will be so much more fun! Especially the scene with the 2 old ladies in their tea shop is hilarious. 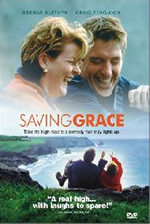 Saving Grace is not so much a movie as it is 90 minutes long, easy-going cannabis commercial. The message clearly is: there's nothing bad about smoking pot or even growing it. I guess big part of the audience who has never tried the stuff before got the sudden urge to light up a joint just because of the way "Saving Grace" deals with this drug. On the other hand, people who hate this film most are the ones who still think that marijuana and heroin are basically the same thing.